Added September 6, 2005: The results have been announced, and Turner's The Fighting Temeraire received the most votes. See the highlighted text below for full results. 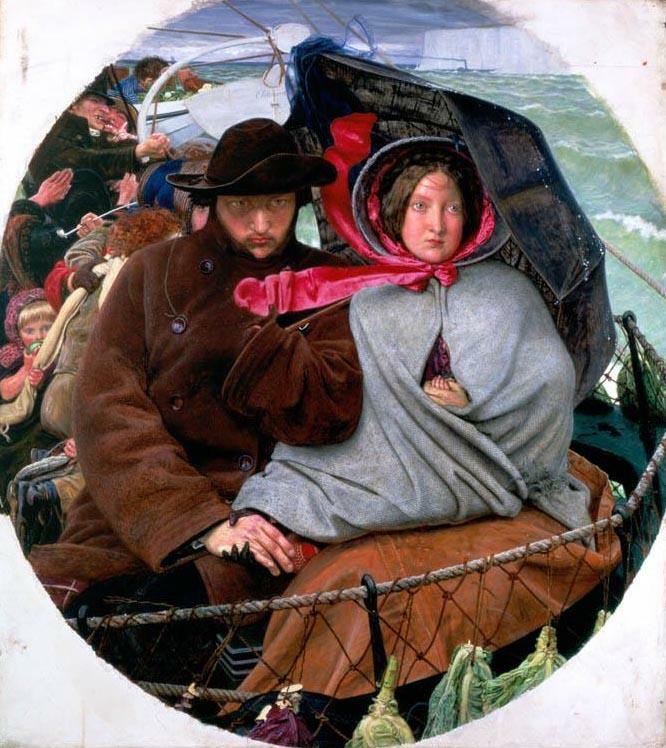 On August 15, BBC Radio 4 announced the shortlist for its Greatest Painting in Britain survey. The jury, consisting of dancer Deborah Bull, art critic Martin Gayford and artist Jonathan Yeo, selected ten works from an initial public vote. Turns out the jury members were given some guidelines, which seem to have been (1) not to select two paintings that are too similar or by the same artist, (2) to give extra weight to paintings that reflect the British national character (six of the ten painters are British), and (3) not to choose anything that requires explanation (only one of the works was painted post 1900). Of course the jury couldn't help but be controversial in what they omitted from the top ten. At the end, there were zero works by Raphael, Holbein, van Dyck, Waterhouse, Gainsborough, Joshua Reynolds, Picasso, Monet, Rubens or Rembrandt. In fact, Rembrandt's Girl At a Window garnered the most nominations, but the public's choice was overruled as being second rate. My first reaction to the list was, Where's The Lady of Shallot? Was The Last of England specifically selected so that a painting from the Pre-Raphaelite era wouldn't win? Martin Gayford offers his insider's look on the winnowing work of the jury. Richard Dorment, Gayford's colleague at the Telegraph, weighs in on what makes for popularity in art. A painting has to have a "powerful central image in which we can recognize something of ourselves, some true emotion." In the same article, Serena Davis offers bullet points on what makes each of these work "art". Tom Lubbock of the Independant pithily puts down the choices and floats an alternative list. We're simply going to focus on where to see high-quality scans of these images, so that the public can make the best possible judgment. There is, of course and needless to say, no substitute for seeing the works in person. Unfortunately, extremely few people will have seen every one of these paintings in person; thus the public will have to make their choice based to a greater or lesser extent on reproductions. With the exception of the Hockney painting, which is unaccountably not being displayed by the BBC or by the Tate Gallery (presumably for copyright reasons, but come on), all the paintings are viewable online in pretty good quality at the website of the museum where they reside. In fact, the National Gallery zooms are extremely good, if you can put up with the small viewing area and the words "THE NATIONAL GALLERY" watermarked onto every image. Below are links to the museum's image of each work, as well as to one or more images from other websites that in most cases are even better. If you've evaluated the works and would like to cast a ballot, go to the Greatest Painting in Britain Vote Page. The winner will be announced September 5.